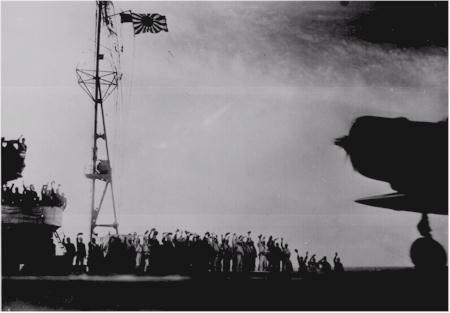 Aboard a Japanese carrier before the attack on Pearl Harbor, crew members cheer departing pilots. Below: A photo taken from a Japanese plane during the attack shows vulnerable American battleships, and in the distance, smoke rising from Hickam Airfield where 35 men having breakfast in the mess hall were killed after a direct bomb hit. The USS Shaw explodes during the Japanese air raid. Below Left -- The battleship USS Arizona after a bomb penetrated into the forward magazine causing massive explosions and killing 1,104 men. 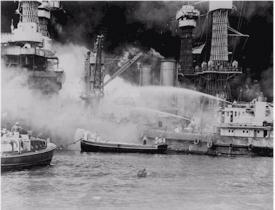 Below Right -- Dousing the flames on the battleship USS West Virginia, which survived and was rebuilt. December 6 - Washington, D.C. - U.S. President Roosevelt makes a final appeal to the Emperor of Japan for peace. There is no reply. Late this same day, the U.S. code-breaking service begins intercepting a 14 part message from the Japanese and deciphers the first 13 parts and passes them on to the President and Secretary of State. The Americans believe a Japanese attack is imminent, most likely somewhere in Southeast Asia. December 7 - Washington, D.C. - The last part of the Japanese message, stating that diplomatic relations with the U.S. are to be severed, reaches Washington in the morning and is decoded at approximately 9 a.m. About an hour later another Japanese message is intercepted. It instructs the Japanese embassy to deliver the main message to the Americans at 1 p.m. The Americans realize this time corresponds with early morning in Pearl Harbor, which is several hours behind. The U.S. War Department then sends out an alert but uses commercial telegraph because radio contact with Hawaii is broken. Delays result in the alert arriving at headquarters in Oahu around noon time (Hawaii time) four hours after the attack has already begun. December 7 - Near Oahu, Hawaii - The Japanese attack force under the command of Admiral Nagumo, consisting of six carriers with 423 planes, is about to attack. 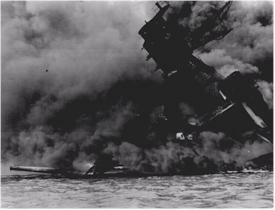 At 6 a.m., the first attack wave of 183 Japanese planes takes off from the carriers located 230 miles north of Oahu and heads for the U.S. Pacific Fleet at Pearl Harbor. Pearl Harbor, Hawaii - At 7:02 a.m., two Army operators at Oahu's northern shore radar station detect the Japanese air attack approaching and contact a junior officer who disregards their reports, thinking they are American B-17 planes which are expected in from the U.S. west coast. Near Oahu, Hawaii - At 7:15, a second attack wave of 167 planes takes off from the Japanese carriers and heads for Pearl Harbor. Pearl Harbor is not on a state on high alert. Senior commanders have concluded, based on available intelligence, there is no reason to believe an attack is imminent. Aircraft are therefore left parked wingtip to wingtip on airfields, anti-aircraft guns are unmanned with many ammunition boxes kept locked in accordance with peacetime regulations. There are also no torpedo nets protecting the fleet anchorage. And since it is Sunday morning, many officers and crewmen are leisurely ashore. The Americans are taken completely by surprise. The first attack wave targets airfields and battleships. The second wave targets other ships and shipyard facilities. The air raid lasts until 9:45 a.m. Eight battleships are damaged, with five sunk. Three light cruisers, three destroyers and three smaller vessels are lost along with 188 aircraft. The Japanese lose 27 planes and five midget submarines which attempted to penetrate the inner harbor and launch torpedoes. 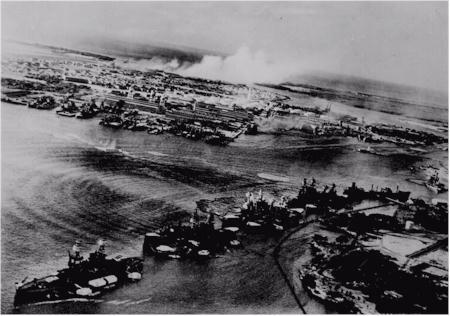 Escaping damage from the attack are the prime targets, the three U.S. Pacific Fleet aircraft carriers, Lexington, Enterprise and Saratoga which were not in the port. Also escaping damage are the base fuel tanks. The casualty list includes 2,335 servicemen and 68 civilians killed, and 1,178 wounded. Included are 1,104 men aboard the USS Arizona battleship killed after a 1,760 pound air bomb penetrated into the forward magazine causing catastrophic explosions. In Washington, various delays prevent the Japanese diplomats from presenting their Declaration of War to Secretary of State, Cordell Hull, until 2:30 p.m. (Washington time) just as the first reports of the air raid at Pearl Harbor are being read by Hull. News of the "sneak attack" is broadcast to the American public via radio bulletins, with many popular Sunday afternoon entertainment programs being interrupted. The news sends a shockwave across the nation and results in a tremendous influx of young volunteers into the U.S. armed forces. The attack also unites the nation behind the president and effectively ends isolationist sentiments in the country. The next day, the United States and Britain declare war on Japan with President Roosevelt calling December 7, "a date which will live in infamy..." On December 11, Germany and Italy declare war on the United States. Thus the European and Southeast Asian wars now become a global conflict with the Axis powers, Japan, Germany and Italy, united against America, Britain, France, and their Allies. 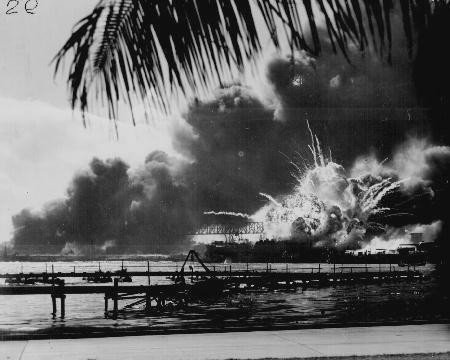 Both senior commanders at Pearl Harbor; Navy Admiral, Husband E. Kimmel and Army Lt. General, Walter C. Short, are relieved of their duties following the attack. Subsequent investigations will fault the men for failing to adopt adequate defense measures. On December 17th, Chester W. Nimitz succeeds Kimmel as commander of the Pacific Fleet.